On the morning drivetime show on our local radio station BBC Radio Gloucetershire, Presenter Mark Cummings has created an ingenious feature called 'The Phone With No Home'. It is as you might have guessed, a mobile phone that passes from person to person around the County. Started a few months ago, the phone is given to someone, who answers it at about 8.40am, chats about themselves, then passes it on to the next person and so on and so forth. The process is designed to be organic, and so you get a whole range of individual characters on the show, from local Business People to the owner of a Village shop, a retired person to a young adult. Anyone could answer the phone and what they say really might surprise you! This feature is one of my faves and I listen to it nearly every morning! I've loved the personal and interesting stories which have been shared along the way and think it is a great way to get to know more about the County! To my surprise, just over a week ago my friend Glyn text me on Sunday evening, letting me know he'd been given #ThePhoneWithNoHome by his brother and would be appearing on air on Monday morning. He wanted to pass it on to me if I was willing, to be on air on Tuesday! Of course I was! I wasn't going to pass up an opportunity for a little more Alopecia Awareness. So last Tuesday, I proudly answered #ThePhoneWithNoHome (a dream come true for me) and had a quick chat with Mark Cummings. Aside from one or two technical difficulties with signal, and a bit of muddling of words, it went pretty well I think! At least well enough that I can now announce that tomorrow morning, at around 7.15am I will actually be in the BBC Radio Gloucestershire studio sharing more of my story and importantly talking about Alopecia Awareness Month! A perfect way to kick off a month of awareness! Please tune in tomorrow from about 7am (if you are up) and listen live to the show. If you aren't in Gloucestershire, then you can listen online here. In the meantime, there are just two things left to do. The first is to thank Glyn from Collett and Holder for giving me the phone, and Gill Parker Sculptor for taking it from me, and the second is to point you in the direction of my stint with #ThePhoneWithNoHome on BBC iPlayer at about 2hr53! Thanks folks and wish me luck! Lately, I’ve been writing many of my blogs on the go on my iPad, uploading them onto the blog from the app; well at least I thought I had been! A number of you have been in touch to point out that I haven't blogged at all in August and wondering if I've given up?! The good news is, no I haven't given up! The bad news is that unfortunately, my posts haven't been uploading and so you've been missing out! The even more bad news for me is it seems I cannot fix it and so I've spent much of the Bank Holiday copying out and back-dating all the posts I'd written! The good news for you is that they are all now up and you can scroll back and read them! What's more, redownloading the blog app seems to have fixed the upload problem, so it shouldn't happen again! I will be keeper a closer eye on things from now on though! At the time of writing (31st August), I have about 4-5 more blog posts still to retype, so please bear with me and there will be a few more posts appearing with August dates on *sighs*! For those of you who have missed me thanks, and very sorry for all the problems! Happy reading of the old ones and there are lots of new to come too! As you know, for me, awareness of alopecia and other hairloss conditions is crucial to helping change perceptions, and ensuring body confidence for those who are going through hairloss difficulties! Well, I have some exciting news for you - next week, (commencing 7th September) Pretty Bald is taking over the @Chelt52 account on Twitter. We are very excited to be undertaking such a big project and we’d really appreciate it if every one of you guys could support us. It’s really easy, all you have to do is follow @Chelt52 on Twitter and retweet us! There any many reasons why Pretty Bald is taking over @Chelt52 but the main one is of course to raise awareness. The account has nearly 10,500 followers, which is a pretty big audience for our Alopecia message! Even better, we asked for (and were granted) a week in September, taking advantage of the fact that September is National Alopecia Awareness month. How fitting! Running Pretty Bald as a business, my ambition is to provide a useful service, with products that we all need (at least baldies do), at the same time raising as much money as possible for charity. The whole business is running not-for-profit, which means when you buy a product from us, any profit that would normally go to the staff and Directors of a business instead go to charity! A win-win! Just as important for me, is our ambition to empower women (and men) locally and nationally who are suffering from hairloss and other circumstances and conditions which affect their confidence. Our first project of course was the Pretty Bald Calendar, and @Chelt52 is another example of this awareness campaign. All you have to do to check out my week with @Chelt52 is to hop onto Twitter, click 'follow' on the account, then watch as I tweet and if you're feeling nice, Retweet or Favourite the things you like the most so that between us, we can make it go as far as possible! Calm: in the early days, feelings of bring 'calm' seemed few and far between and I was in a semi-agitated state most of the time. Difficult as it will be, try your best to stay calm for two reasons; first, it helps you think more rationally and second, in things some cases e.g. Alopecia, feelings of stress can exacerbate the issue. Cancer: Possibly the most obvious one when it comes to hairloss is cancer. Whilst the disease itself does not affect the growth of the hair, treatment in the form of chemotherapy causes partial or total hairloss. As treatments improve however, the rate and finality of hairloss is diminishing and there is hope that in the future, the hair won't be affected at all. Fingers crossed! Caps / Coverings: other words for Bandanas as covered in our 'B' post, caps and coverings can be a great go-to for keeping things hidden. Even if you are used to your hairloss and are happy to expose it, caps and coverings are a great way of keeping toasty warm, accessorising and outfit or keeping the sun off your head! Caring: if you let them, in my experience people will be really caring about you and your hairloss. A mistake I frequently made was feeling guilty about being upset and so I kept shutting people out and bottling it up which wasn't good for me, or for those around me! People will be caring, you just have to decide to let them! Cause: fairly self-explanatory this one, but cause is a huge factor in any hairloss experience! I remember thinking 'but I don't understand what causes it!' A large part of your experience will centre on causes and of course then the cure. What you may have to accept is that the cause may be unclear - they can give you a label e.g. Alopecia Areata or Trichotillomania, but that doesn't necessarily mean the 'cause' will be clear. Challenge: Losing my hair was probably the single biggest challenge I have ever had to face, but on the plus side it's a challenge that I won! Now I am working to challenge perceptions and help others beat that challenge! Changes: Inevitably, if you are losing your hair - via whatever means - then you will be going through some changes. From physical changes to your appearance to changes to your general health and wellbeing, to adjustments in your emotional and mental state, changes are inevitable. It is definitely worth highlighting here that not all changes are for the worse - I and many others I know have had positives come out of their hairloss and definite changes for the better! Cheated: This was a huge 'problem' for me and many others I know. As your hair falls out and you struggle to deal with it, many people highlight how they feel 'cheated' by their body and struggle not to feel angry with themselves. The good news is that this feeling passes and hopefully will be a temporary status rather than a permanent reality! Chemotherapy: one of the most common treatments for cancer, chemotherapy uses chemicals to permanently damage cancerous cells so that they can't reproduce. Unfortunately, side-effects include damage to other healthy tissues, including hair follicles, resulting in hairloss. Second, whilst hairloss is terrifying and somewhat devastating at every stage of life, but somehow, despite their resilience, it seems ten times worse when a child goes through it. It breaks my heart every time I see it, but I admire there general acceptance of it too! Cicatricial Alopecia: the scientific name for scarring Alopecia, it includes traction Alopecia and Alopecia from any scarring. Comments: when you are bald or balding, comments can be expected and often unappreciated. From stating the obvious to striking up a conversation, to frankly being downright hurtful, there's not a baldie I know who has been completely without commentary! There's not much to say here - it's on a case by case basis and you'll have to handle it as best you can when it happens. Not everything will be bad though; just remember that! Confidence: I'd love to say hairloss has no significant effects, but it's likely that it will impact your confidence in some way. It could be a little or a lot depending on your personality, support network, attitude and general attachment to your hair. You need to accept that this will happen; you are not weak, worthless, shallow or anything else negative you might think about yourself - it is completely understandable and acceptable. Work through this, deal with it your way and try to remember not to let your hairloss beat you - don't let it change who you are or what you do. I really and truly appreciate this is easier said than done, however it's something I worked hard at and now if anything, I am more, not less confident than I was before! Corticosteroids: more commonly referred to as steroids, corticosteroids are often used in the treatment of a number of hairloss and / or auto-immune conditions. They can be taken orally, injected or applied as a topical cream or lotion and have anti-inflammatory properties. They are used to help suppress the immuno-response, thereby enabling short-term and sometimes permanent regrowth. Cure: A natural progression from 'cause', cures are one of the primary things that people pursue, providing a focus for anxiety, mental challenges or even an end point. Cures are a good thing to understand and appreciate, but pursue with caution; sometimes the side-effects can be as bad or worse than the hairloss and many have limited or questionable results. Pursuit of them can also become an obsession so take care that this doesn't become more damaging to your psyche. Sit down with a trained expert question what they tell you so you fully understand the implications, then give yourself time to consider everything - is it really what you want? As many of you may have realised, I live and work in Gloucestershire in the South West of the UK, and whilst I have ambition to raise awareness of hairloss across the UK (with some other lovely gents and ladies), I'm also trying to stick my head above the parapet in my local area too! Anyway, I'm proud to announce that the finalists for the Gloucestershire Business Awards have been decided and that Pretty Bald, together with apt marketing & pr has become a finalist for the “Best Marketing Campaign” category thanks to the success of the Pretty Bald Alopecia Awareness Calendar! Entering these awards is just one way of raising awareness, and even if we don't win, the business and the cause will benefit from local press coverage, as well as greater awareness in the community. Hopefully this will translate into better awareness of hairloss and importantly, more fundraising. The Gloucestershire Business Awards are a prestigious local event and encourage businesses all over the Gloucestershire county to come together and celebrate their growth and achievements. The annual award ceremony is now in its eighteenth year and Pretty Bald was one of 134 businesses who entered across all the awards categories. We're delighted to be one of four finalists in the “Best Marketing Campaign” category and wish the best of luck to our fellow finalists BAM agency, Barrington Ayre Shirtmaker and Tailor, and Rock the Cotswolds! The awards will be held at the Cheltenham Racecourse in October with a fancy three course meal and awards presentation... any excuse to buy a new dress and maybe even a new wig! It’s so exciting! Fingers crossed! As you know, the Pretty Bald Calendar simply wouldn't have been possible without the agreement of eleven other ladies to get involved! That's why, each month we share the story of one of these brave ladies..
Katie was 18 when she lost all of her hair, the process having started just weeks before her 18th birthday. Nevertheless, Katie tried not to let her hairloss prohibit her life; she went to University with her first wig although she had only been wearing it for a month. 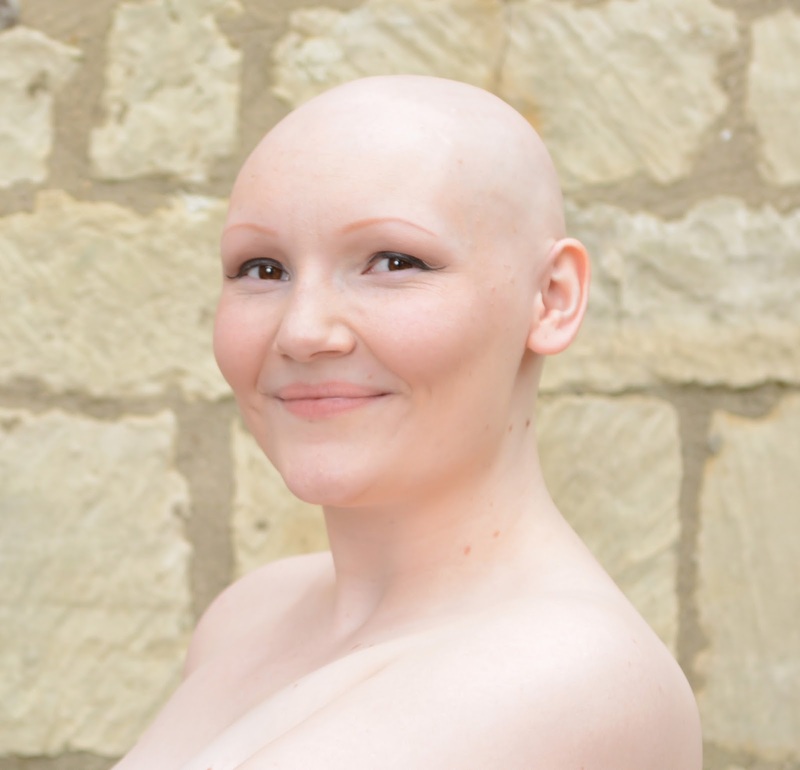 During the next two years Katie’s confidence slipped gradually and by the time she joined Alopecia UK her self-belief and love of her looks were at an all time low. 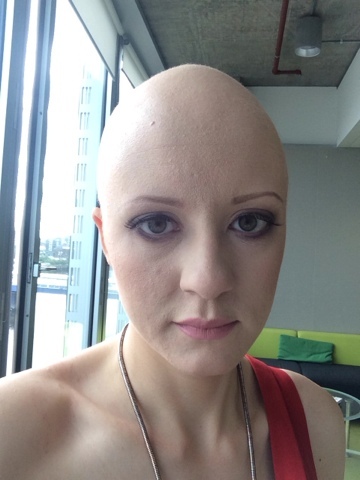 Getting involved with Alopecia UK however enabled Katie to build herself back up again to her former self. To find out more about Katie and her story click here. For those avid readers of this blog, you may have spotted that I've had my fingers crossed for a top secret project in Glasgow to go ahead. Well eventually the news that we were waiting for arrived! It was happening! 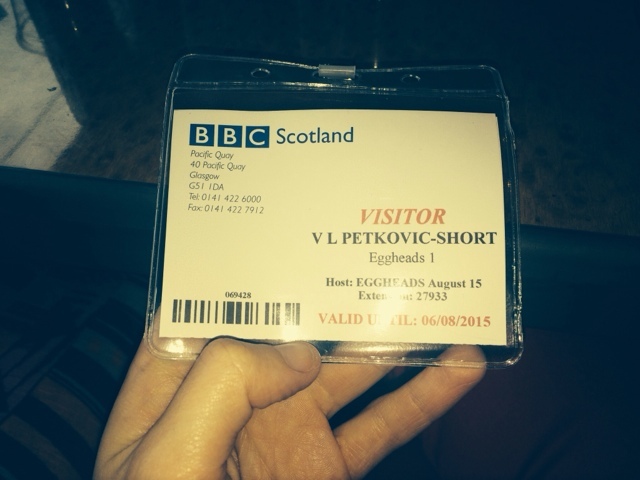 We were all set, our trains were booked and less than a week after that fateful phone call, a team of fellow alopecians and I filmed the BBC Quiz Show Eggheads! Yes really! Five other lovely ladies and I travelled up to Glasgow on August 7th to face the Eggheads team on National TV; needless to say we were all scared about what could happen. It started (for me at least) with a six and a half hour train journey as apparently all the episodes are filmed in Glasgow - not that you'd know it! After a very late night arrival and a mix up with the bedrooms at the hotel, we slept, and just five hours later we were in the taxi destined for the studio for a very early 7am start! Something you may or may not know about filming a programme is the complexities of your outfit. From washing you out, to strobing on screen, there are a whole host of outfits that you can't wear on TV. Trust me, two pages of clothing 'rules' later and my required four outfits had morphed into ten in a rather large suitcase. You think I am joking, but only two things in my entire wardrobe are unpatterned, bright, not strappy, didn't have stripes, aren't dark and aren't floaty or lacy. Instead, I had to take ten 'nearly right' outfits for them to choose from, just in case! Thankfully, after we arrived, the wardrobe team found an outfit they liked and I was able to go on set fully clothed! We had our make-up done too, which was a blessing at that time of the morning, not to mention the fact that my make-up artist created perhaps the most perfect set of eyebrows I've ever had, even before they fell out! Kudos! Once we were ready, we were guided to the studio to film as the first team of the day and seated in our team 'order'. This is where we would sit for the whole show and at this point we were all experiencing elation, nerves, a mildly sick feeling, masses of excitement and a million things besides. It felt like we'd done it - we'd made it to the show after a mammoth amount of organisation and somehow that felt like the hard bit was over. At least at that very second it did. Then... in walked Jeremy Vine and our five challenger eggheads and we realised, nope, the hard bit was still to come! 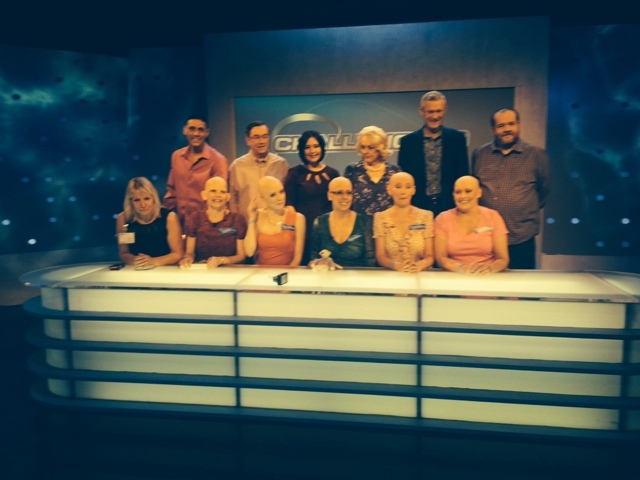 We competed under the team name ‘A Clearer Head’, although perhaps we should have called ourselves ‘The Real Eggheads’, and our main reason for going on the show was to help raise awareness of alopecia. You can't deny a team of mad, excitable, bald women on National TV is certainly going to make a splash. I was surprised by how much time goes into filming a 30 minute episode. It takes a long time (about four hours) and even then we went over schedule because we chatted so much! 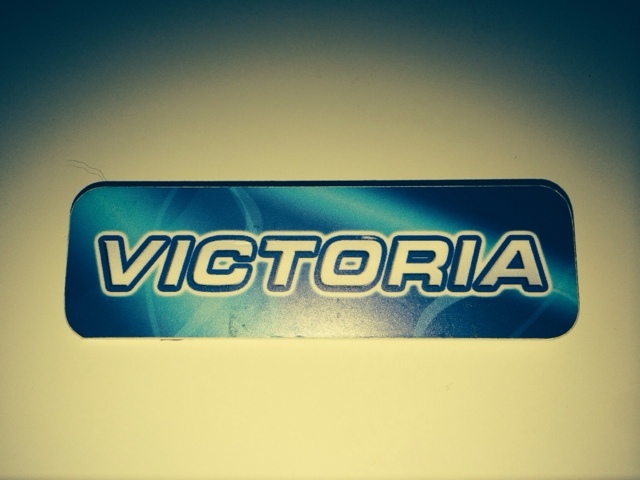 It astonished us how many people there were on set who all had jobs to do; there was even a lady from wardrobe with the title ‘Badge Straightener’ just to ensure our name badges were level on screen! Anyway, as usual, I digress and I'm sure you're dying to know what happened and how much we were playing for! Before we got to filming, we of course did some research and discovered that as of February 2015, the Eggheads had only been defeated 122 times out of 1359 attempts; this thought didn’t fill us with much confidence, but still, awareness was key and it was still worth a shot! Even better if we could win some money for Alopecia UK - fingers crossed, but we didn't hold out much hope! At this stage, I am not allowed to tell you either how much we played for (it will give away whether other teams win or not) and nor am I allowed to tell you if we won for the same reason - #SpoilerAlert'! Needless to say though we left with a feeling of Mission Accomplished with an episode in the bag putting Alopecia front and centre on National TV. What's more, it was great to meet the team - Jeremy Vine is totally awesome, really intelligent and interesting. The eggheads aren't half bad either and despite a cool, superior facade on TV, they are actually bubbly, friendly and welcoming! A delight! There is nothing much more I can say. We don't yet know when the episode will air, but as soon as we do, I'll of course let everyone know! One more thing worth a mention before I sign off this post. Just before the train, and to finish off our long day (at lunchtime) we went to a fish and chip shop where we met an alien. 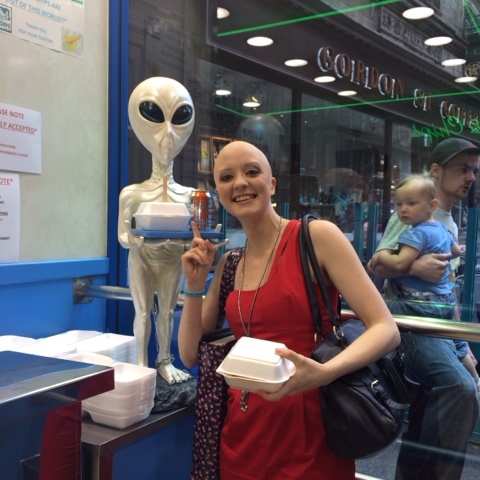 Spotting a fellow 'baldie' was the icing on the cake and I couldn't resist taking this photo - possibly my favourite! Who would have thought we’d spot an alien in a fish and chip show in Glasgow? I think it’s safe to say all of the girls and I were awed by how fantastic everyone was and we would definitely re-live the experience if we had the chance. I’d like to take this opportunity to thank the whole cast and crew of Eggheads, from the makeup artists who made us feel very glamorous to the actual team, for being very hospitable and making us feel so welcome. A mention must also go to the show producers 12 Yard Productions for helping make it all happen! We all had an absolute blast! In the meantime, you can keep your fingers crossed we won and I'll keep you posted when you'll be able to spot the episode...! If someone said to you 'Hey, would you like to be the same as everyone else?'... I doubt many of you would go 'Yeah sure'. Being different... I'm very sure when people strive to be different, they don't wish for alopecia but we do know that many people want to stand out from the crowd. Who wants to be the same? Why would you want to blend into the crowd? For example, being a nice person often makes you stand out, being another sheep in the herd is dull and undesirable. A spiritual leader named Yogi Bhajan once said “Our hair fashions might be just a trend, but if we investigate, we may find that we have been depriving ourselves of one of the most valuable sources of energy for human vitality.” This is regarding the belief that you should not cut your hair in some cultures. Take that as you will but largely, losing your hair is a big deal... It's not 'just hair'. However, in a more serious tone, I think losing your hair through alopecia helps give you access to some feelings which ordinary people can find hard to feel, like Rachel in my last post, she claims alopecia improved her life! I do truly think that alopecia has the potential to improve a person, make them stronger and perhaps help them discover what is really important in life. "Baldness is a gift from nature. Once you begin to lose hair, you realize you are ageing and that nothing about you is forever. You are not here for admiring yourself in the mirror but for changing this world. Therefore you'll become wiser and death won't make you worry." This to an extent backs up my point, losing your hair can be a tool to really improve your life. This may seem like an impossible or improbable outcome to some of you but I would again like to use Rachel as an example of someone in their last stage of alopecia- self acceptance. This is not to say that others without alopecia cannot achieve this but I'll I use an analogy to help explain. Say a wall for example has several coats of paint on it, to reach the raw wall, and actually see what it truly looks like, what it's made of, the paint has to be sanded off- if we replace the wall for YOU and the paint for HAIR and the sand paper for ALOPECIA, you can see what I mean about it helping you to find yourself. Following on from this, I think what is important in life in general is not to wish it away. It is easy to constantly look forward to the future or hope for better days/dream about an 'ideal life' but it is very important to enjoy the present. In this case we can relate it to alopecia, please do not waste all your energy on waiting for your hair to grow back so you can 'be happy again' because who needs hair to have fun?! Enjoy now, (that's why it's called the present). ...it's time to turn over that calendar page! Whoop whoop! As you may have spotted, this month features a somewhat seasonal picture of a summery Jacuzzi, with champagne, obviously! In reality, this was the very first picture that was taken that day at 7am, and this was only the first glass! It was awkward, chilly, very splashy and an odd ice-breaker. In fact, I have to thank each of the girls in the tub with me for not bailing at this point and for helping me hold it together! Miss August is the gorgeous Katie - one of the youngest on the shoot - and we'll catch up with her later in the month!